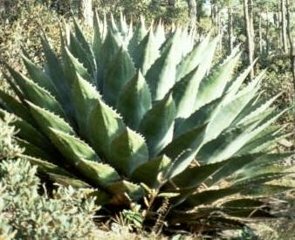 Agaves belong to the Amaryllis family (Amaryllidaceae) and are native to the southwestern US and Mexico. Very slow growing, they can take years to reach maturity, with 6 foot long leaves, and may die once they flower, but they do tend to come again from suckers. Tough and rugged, these plants can withstand heavy droughts and mistreatment. The blooms, when they appear, are borne on a tall spike, 15 to 25 feet tall and have clusters of yellow green blooms. Plants can be propagated by sowing seed or by removing and replanting suckers. Seeds should be sown in pots, trays or a bed prepared with a sandy soil or other medium (1 part sphagnum pea to 2 parts sand will do). The medium should be kept moist (but never soggy) and at 75F. Young seedlings should be transplanted to containers or to their permanent positions outdoors, in warmer climates. 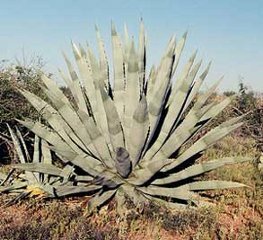 Agaves are used for their fiber, which is used commercially as henequen and with sisal and hemp to make rope and twine. Plant hearts are cooked and eaten, and the juice from the leaves is used as a sweetener and to make Tequila.